Will booming India topple China in Latin America? For the second consecutive year, the booming Indian economy grew faster than any other in 2016, according to a new World Bank report. A strong macroeconomic performer compared to the other so-called BRICS nations, India’s GDP is expected to grow by 7.8% this year, buoyed by investor confidence and the positive effect of low oil prices on real incomes. Notably, it has become an “important source of foreign direct investment”, says the paper entitled Global Economic Prospects 2016. Since the turn of the century, India is increasingly looking overseas, to primary export-oriented countries. “Given India’s continuing and even growing demand for energy, grain, edible oils and other products that Latin America can offer, there is immense potential,” says Deepak Bhojwani, head of consultancy LatIndia and a former Indian ambassador to seven Latin American countries. The estimated US$46 billion in annual trade between India and the 33 member countries of the Community of Latin American and Caribbean states (CELAC) will be welcome in a region adversely affected by China’s economic slowdown. Although expected to recover this year, Latin America’s GDP growth contracted by 0.4% in 2015, with the region’s main economic motor, Brazil, slipping deeper into recession. However, India’s investments in environmentally sensitive sectors such as energy, agriculture and infrastructure in Latin America are a worry for some experts who have observed accelerated ecological damage since China’s entry into the region. “With respect to these new financiers, like Indian and Russian banks, we should be concerned, very concerned,” says Paulina Garzón, director of the China-Latin America sustainable development initiative at American University. Garzón is wary of the influence new investment streams can have on environmental regulations in Latin America, but concedes that the crux of the problem lies with host governments and their perception that enforcing strict rules is a waste of money. Little is known in Latin America about the new Indian banks looking to invest in a region separated by distance, language and culture, Garzón says. New export markets for natural resources are keenly sought by Latin America in the context of waning demand from China, observers have noted. Latin American suppliers may try to keep production levels high to compensate for lower commodity prices, but not all experts believe this will lead to an increased Indian market share at China’s expense. Expected to hit US$ 250billion in the next four years, China’s trade with the region still dwarfs that of India. “Chinese companies, backed by Chinese capital looking for productive investment opportunities, will pursue opportunities in overseas markets such as Latin America more aggressively than before,” analyst R. Evan Ellis told Diálogo Chino. In the commodities sector, where decreasing Chinese demand will continue to depress prices, companies across the board, including from India, will invest more cautiously, he adds. Bhojwani notes that India’s expansion into Latin America will be driven by private sector efforts at meeting domestic market demand rather than a state-led, strategic push for food and energy security, as is the case with China. Thus, he says, they cannot compete. “India’s trade with Latin America is independent of the China factor,” says Bhojwani, adding that investments by India’s state-owned companies in high-carbon sectors such as oil pale in comparison to those made by their Chinese equivalents. Although growing, India’s carbon footprint in Latin America will remain far lower than China’s for the foreseeable future, Evan Ellis says. India invests overseas through development finance institutions (DFI’s) which, as in most countries, are subject to government regulation. But unlike their Chinese counterparts, Indian banks are not subject to rules aimed at limiting the environmental impacts of investments overseas. In fact, so far only one of India’s big institutional investors, IDFC, has signed up to the Equator Principles, a voluntary and internationally accepted risk management framework for development finance. The lack of rules applicable to Indian banks investing overseas is doubly concerning to Garzón who notes that advances in environmental governance in Latin America have steadily declined in recent years. “For example, as recently as 2014, Venezuela’s ministry of the environment was dissolved as an autonomous entity,” Garzón points out, adding that regulations relating to environmental licensing and impact assessments in the mining sectors in Peru and Ecuador have also slackened. Bhojwani acknowledges that increasing production Latin America’s extractive and agriculture sectors has consequences for the environment but says joint efforts at research and development in the area of greener technology can compensate for these. India plans to generate between 15-20% of its electricity (175 gigawatts) from renewable sources by 2030, Bhojwani says, and points to India’s “sophisticated indigenous programme” for nuclear power generation as a potential area of cooperation. The programme will require enormous supplies of uranium, a resource Latin America has in abundant supplies. “In turn, the technologies and experience of India in this field can come in handy for Latin American countries that want to move away from fossil fuels,” Bhojwani adds. India’s investors have a long way to go before enjoying the same kind of high-level access to Latin America’s key legislators as China. 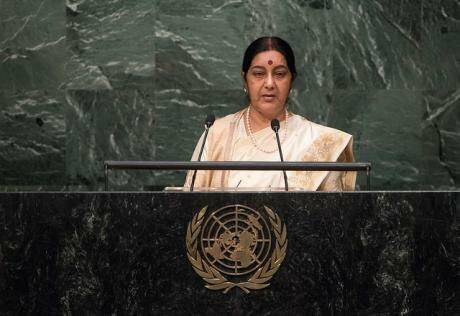 The growth in trade has been accompanied by a diplomacy drive led by India’s external affairs minister, Sushma Swaraj. On the sidelines of the latest UN General Assembly in New York, Swaraj met Caribbean Community (CARICOM) leaders and finance ministers from the CELAC leadership quartet, with whom she pledged to boost cooperation on education, trade and climate change and improve relations, which have been tested in recent years. In 2012 the Bolivian government cancelled a US$ 2.1billion contract with India’s Jindal Steel to develop the El Mutún iron ore mine. The proposed investment was the largest by an Indian company in Latin America but collapsed amid rows over contract terms and the contractor being allowed access to the site. In August 2014, the International Chamber of Commerce ordered the Bolivian state to pay Jindal US$ 22.5million in compensation. Two Chinese companies, Sinosteel and Henan, are now bidding for the project. “This was a unique and extremely large investment that should have been better planned,” says Bhojwani, who suggests that the breakdown of the deal was attributable to “misplaced expectations” on both sides. Evan Ellis agrees that the Jindal dispute is unlikely to put off a diverse array of Indian businesses, but points out that it is not unique. “The experiences of Reliance, India Oil and OVL in Venezuela, for example, have been less than positive,” he says, adding negative experiences are part of the learning process for investors in overseas environments. While Indian companies, like many private Western firms, may bend or ignore environmental regulations, their negotiating position as individual firms regulated by Latin American states is arguably weaker than those from China. “Chinese firms self-financing and protection by a political framework may give them more latitude to behave with impunity,” Evan Ellis argues. This article was first published by Diálogo Chino.